AWS IoT sends progress events about each message as it passes from your devices through the message broker and rules engine. 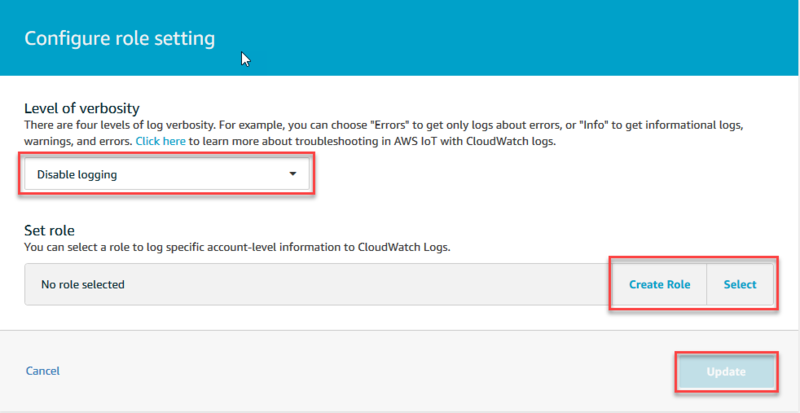 To view these logs, you must configure AWS IoT to generate the logs used by CloudWatch. For more information about CloudWatch Logs, see CloudWatch Logs. For information about supported AWS IoT CloudWatch Logs, see CloudWatch Log Entry Format. To enable AWS IoT logging, you must create an IAM role, register the role with AWS IoT, and then configure AWS IoT logging. 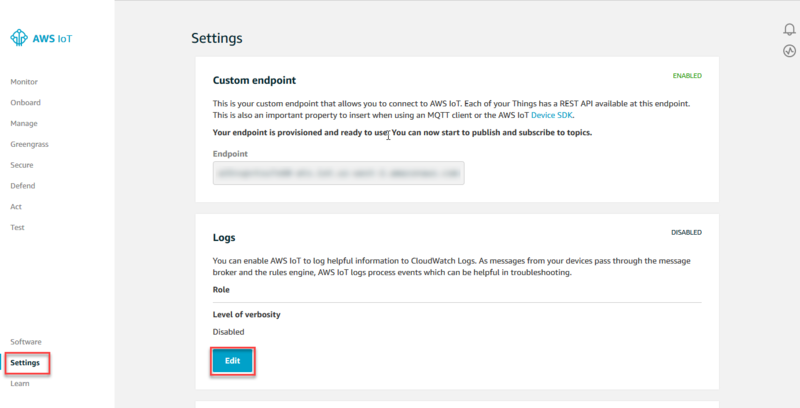 Before you enable AWS IoT logging, make sure you understand the CloudWatch Logs access permissions. Users with access to CloudWatch Logs can see debugging information from your devices. For more information, see Authentication and Access Control for Amazon CloudWatch Logs. Use the IAM console to create a logging role. From the navigation pane, choose Roles, and then choose Create new role. Choose AWS Service Role, and then for service role type, choose AWS IoT. Choose the AWSIoTLogging role, and then choose Next Step. Enter a name and description for the role, and then choose Create role. The following policy documents provide the role policy and trust policy that allow AWS IoT to submit logs to CloudWatch on your behalf. These documents were created for you when you created the logging role. The log level specifies which types of logs are generated. Any error that causes an operation to fail. Logs include ERROR information only. Anything that can potentially cause inconsistencies in the system, but might not cause the operation to fail. Logs include ERROR and WARN information. High-level information about the flow of things. Logs include INFO, ERROR, and WARN information. Information that might be helpful when debugging a problem. Logs include DEBUG, INFO, ERROR, and WARN information. You can use the AWS IoT console, the set-v2-logging-options CLI command, or the SetV2LoggingOptions API to enable logging. The principal used to make the API call must have Pass Role Permissions for your logging role. The logging role is passed to set-v2-logging-options or SetV2LoggingOptions as the roleARN parameter. You can configure logging to be global or fine-grained. Global logging sets one logging level for all logs no matter what resource triggered the logs. Fine-grained logging allows you to set a logging level for a specific resource or set of resources. Currently, only thing groups are supported. You can use the AWS IoT console, the CLI, or the API to enable global logging. You must use the CLI or API to enable fine-grained logging. Your logging role ARN. The logging role grants AWS IoT permission to write to your logs in CloudWatch Logs. When set to true (--disable-all-logs) disables all logs. The default (parameter not used) is false. You can use the get-v2-logging-options CLI command to get the current logging options. AWS IoT continues to support older commands (set-logging-options and get-logging-options) to set and get global logging on your account. Be aware that when these commands are used, the resulting logs contain plain-text, rather than JSON payloads and logging latency is generally higher. No further improvements will be made to the implementation of these older commands. We recommend that you use the "v2" versions to configure your logging options and, when possible, change legacy applications that use the older versions. Sign in to the the AWS IoT console. For more information, see Sign in to the AWS IoT Console. In the left navigation pane, choose Settings. In the Logs section of the Settings page, choose Edit. The Logs section displays your settings for role and level of verbosity. On the Configure role setting page, choose the level of verbosity that describes the level of detail that you want to appear in the CloudWatch logs. Choose Select to specify a role that you created previously, or Create Role to create a role to use for logging. Choose Update to save your changes. Review your CloudWatch logs to see if you are satisfied with the level of collected information. If not, you can always change the logging level later. Fine-grained logging allows you to specify a logging level for a target. A target is defined by a resource type and a resource name. Currently, AWS IoT supports thing groups as targets. Fine-grained logging allows you to set a logging level for a specific thing group. Say we have a thing group called "Phones" that contains things that represent different kinds of phones. We then create another thing group called "MobilePhones" and make it a child of the "Phones" thing group. Fine-grained logging allows you to configure one logging level for all things in the "Phones" group (and any child groups) and another logging level for things in the "MobilePhones" group. In this example, we have assigned two different logging levels to things in the "MobilePhones" group — one from the logging level for the "Phones" thing group and another from the "MobilePhones" thing group — but the logging level specified for the child thing group will override the logging level specified for the parent thing group. An IAM role that allows AWS IoT to write to your CloudWatch Logs. If not specified, AWS IoT uses the logging role associated with your account. The logging role is associated with your account when it is created. For more information, see Create a Logging Role. The logging level used if not specified. Valid values are: DEBUG, INFO, ERROR, WARN, and DISABLED. When set to true (--disable-all-logs), disables all logs. The default (parameter not used) is false. The get-v2-logging-options CLI command returns the configured IAM logging role, the default logging level, and the disableAllLogs value. A JSON object that contains the resource type (field targetType) and name (field targetName) of the entity for which you are configuring logging. AWS IoT currently supports THING_GROUP for the resource type. You can configure up to 10 logging targets. Use the list-v2-logging-levels CLI command to get a list of the currently configured fine-grained logging levels. Call the delete-v2-logging-level CLI command to delete a logging level. Use the delete-v2-logging-level command to delete a fine-grained logging level. The UNIX timestamp of when the client connected to the AWS IoT message broker. The log level being used. For more information, see Log Level. A randomly generated identifier that can be used to correlate all logs for a specific request. The status of the request. The event type for which the log was generated. The value of the event type for each event is listed in the following sections. The AWS IoT message broker generates a Connect log when an MQTT client connects. The protocol used when making the request. Valid values are MQTT or HTTP. The ID of the client making the request. The ID of the principal making the request. The IP address where the request originated. The port where the request originated. The AWS IoT message broker generates a Subscribe log when an MQTT client subscribes to a topic. The name of the subscribed topic. When the AWS IoT message broker receives an MQTT message, it generates a Publish-In log. Publish-In when the message broker receives a message. When the message broker publishes an MQTT message, it generates a Publish-Out log. Publish-Out when the message broker publishes a message. The AWS IoT message broker generates a Disconnect log when an MQTT client disconnects. The Device Shadow service generates a GetThingShadow log when a get request for a shadow is received. The name of the requested shadow. The name of the topic on which the request was published. The Device Shadow service generates a UpdateThingShadow log when a request to update a device's shadow is received. UpdateThingShadow for update shadow logs. The name of the shadow to update. The Device Shadow service generates a DeleteThingShadow log when a request to delete a device's shadow is received. The AWS IoT rules engine generates a RuleMatch log when the message broker receives a message that matches a rule. RuleMatch for rule match logs. The name of the matching rule. The rules engine generates a FunctionExecution log when a rule's SQL query calls an external function. An external function is called when a rule's action makes an HTTP request to AWS IoT or another web service (for example, calling get_thing_shadow or machinelearning_predict). FunctionExecution for rule match logs. A collection of resources used by the rule's actions. When the AWS IoT rules engine starts to trigger a rule's action, it generates a StartingExecution log. StartingRuleExecution for starting rule execution logs. The name of the action triggered. When the AWS IoT rules engine triggers a rule's action, it generates a RuleExecution log. RuleExecution for rule execution logs. When the AWS IoT rules engine cannot find a rule with a given name, it generates a RuleNotFound error log. "details": "Rule example_rule not found"
The name of the topic that was published. The name of the rule that could not be found. A brief explanation of the error. When a message is throttled, the AWS IoT rules engine generates a RuleMessageThrottled error log. "details": "Message for Rule example_rule throttled"
RuleMessageThrottled for rule message throttled logs. The name of the rule to be triggered. The AWS IoT Job service generates logs for the following events. Logs are generated when an MQTT or HTTP request is received from the device. The AWS IoT Jobs service generates a GetJobExecution log when the service receives a job execution request. "details": "The request status is SUCCESS." GetPendingJobExecution for get pending job execution logs. A unique, case sensitive identifier to ensure the idempotency of the request. For more information, see How to Ensure Idempotency. Other information from the Jobs service. The AWS IoT Jobs service generates a DescribeJobExecution log when the service receives a request to describe a job execution. DescribeJobExecution for describe job execution logs. The job ID for the job execution. The topic used to make the request. The AWS IoT Jobs service generates an UpdateJobExecution log when the service receives a request to update a job execution. "details": "The destination status is IN_PROGRESS. The request status is SUCCESS." UpdateJobExecution for update job execution logs. The version of the job execution. When it receives a request to start the next pending job execution, the AWS IoT Jobs service generates a StartNextPendingJobExecution log. StartNextPendingJobExecution for start-next-pending-job execution logs. The AWS IoT Jobs service generates a ReportFinalJobExecutionCount log when a job is completed. "details": "Job 002 completed. QUEUED job execution count: 0 IN_PROGRESS job execution count: 0 FAILED job execution count: 0 SUCCEEDED job execution count: 1 CANCELED job execution count: 0 REJECTED job execution count: 0 REMOVED job execution count: 0"